Melissa Villa is the founder of Project Pearls, a small charity in Ulingan, an impoverished slum community in the Philippine capital Manila. 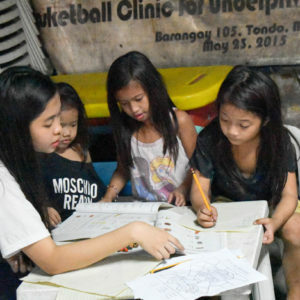 Your organisation works in a small community called Ulingan in Manila, the Philippine capital. Can you tell us a bit more about this community? Ulingan comes from the comes from the word “uling”, which means charcoal. Ulingan is a small slum in Tondo, Manila that sits on a dumpsite, which is surrounded by charcoal factories that emit toxic smoke. There is also limited access to electricity and hardly any access to toilets or sanitation. Children and families have no choice but to live amongst the soot, garbage, mosquitos, flies, and vermin all day and night. The common meal is “pagpag” – leftover food from fast-food restaurants scavenged from garbage sites. “Pagpag” means to shake away the dirt and maggots in the food. Although the Philippines has a growing economy, and there are many reasons to be hopeful, poverty is still a huge issue and nearly 50% of the population live on around $2.00 per day. Nowhere is this more obvious than in Ulingan. 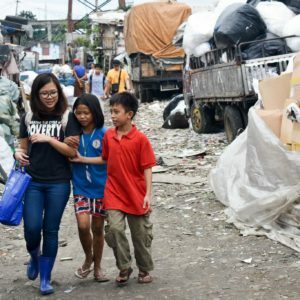 Why do you think poverty is still so endemic in the Philippines? There are many reasons, corruption and red tabe in the government, growing overpopulation, a lack of good employment, lack of investment in education, bad infrastructure. Unfortunately, the disparity between rich and poor is still too wide. It seems the only people with proper “connections” are able to easily access a better quality of education and employment. 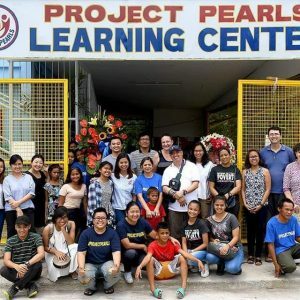 What exactly does “Project Pearls” do in Ulingan? Project Pearls operate various outreach programs for the children, namely in Ulingan, including a feeding program – we serve a hot and nutritious meal to 200-250 children every Saturday. There is also a teaching program – after the meal, we break down the children by age level for educational activities. We offer homework help, basic math, reading, writing and spelling tutorials. We also do arts and crafts, singing and dancing. We also run special activities for children on their birthdays and run a scholarship program for as many kids as we can. We actually built our own Learning Centre for some of these children and assist many others to attend public schools. Because poverty stops many children from attending school, we need to give both the kids and their parents the extra incentive to go to school. Because of this, we also have the Food for Learning Program where we provide monthly groceries to all the children and their families who have 85% attendance. Another important mission for Project Pearls is to provide healthcare. Every quarter we provide medical check-ups to the children and their families as well as free medicine. Because of the hazardous environment in which they live, most of the children, if not all, have different respiratory illnesses and skin diseases. In the first issue of Inquire, Lisa Wiltse broke the hears of readers with her photo-essay about the “Charcoal Kids”. You seem to work very closely with these children and their families. When did this start, and how do you feel work is progressing so far? 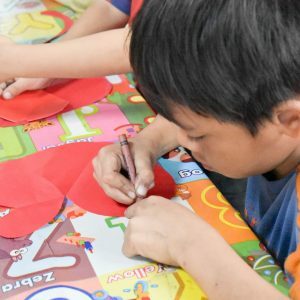 Our organisation first set foot in Ulingan in August 2010 and since then we have seen constant growth in the number of children we work with. The definition of outreach, however, is not just giving these children handouts of donations, it’s more of building a loving and trusting relationship with them and their families. In the past two years, I strongly believe that we have earned the children’s love, respect and trust, not to mention the whole community for that matter. When we go there, we don’t pity them, we see dignity and strength. Every United Nations member state except for the United States of America and Somalia has signed and ratified the UN Convention on the Rights of the Child, which outlines universal human rights for children. 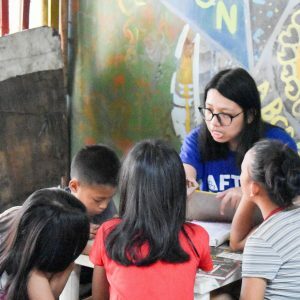 Would you say that children in Ulingan are being denied their human rights? With their inhumane living conditions and the dangers of their surrounding environment, I could easily say that the children in Ulingan are being denied their basic human rights – the right to live, grow-up, develop physically and mentally in a healthy and normal way. Living on a dumpsite surrounded by toxic smoke from the charcoal factories is not healthy and certainly not normal. To be covered with flies and soot, to be working instead of getting an education at school is not healthy and normal. Their basic rights to special care and protection and to give food, housing and medical care are denied not only by the government, but by society as a whole. Do you think the Philippine government could do more to safeguard the rights of children? Certainly, the Philippine government could do more to safeguard the rights of these children. We need champions in the government to ensure that the fundamental rights of the children – rich or poor – are protected and enforced. Are alternatives to work available for the children? For instance, does the Philippine government not provide state education for them? There are public schools where children can attend, but there is a huge room for improvement for the quality of education they provide; the ratio of teacher and students per class should be decreased whilst salaries for public school teachers should be increased. In the picture published by Inquire Magazine in our first issue, taken Lisa Wiltse, the charcoal farming work looks like it would be dangerous for an adult. What kind of health issues do you see in the children? Whith the swirling toxic smoke that comes from the charcoal factory, adults and children suffer from various chronic respiratory illnesses. The lack of sanitation and very limited access to clean water means many children have different kinds of skin diseases as well. Most bathe in the very polluted waters of Manila Bay, as see in Lisa’s pictures. Project Pearls seems to be place a strong emphasis on education in the community. 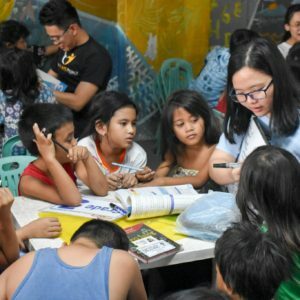 If readers wanted to help children in Ulingan, what would you advise? We believe that education is their only key to get out of Ulingan and out of this painful poverty. Putting them through school, through our scholarship program is not enough however. We also need to provide them with a support system outside school. Most of them live in small, shanty homes where ther is only one room to eat, sleep, and study. We urgently need volunteers, resources and funding to provide this support system and ensure their success in school and beyond. We also want to introdcue a sustainable livelihood program for the parents to give them an alternative or another source of income so that their children are not required to work. What plans does Project Pearls have for the future? Also, what kind of future do you foresee for the “Charcoal Kids” of Ulingan?